Welcome to VLSI Academy. We collaborate with partner universities to boost VLSI education. 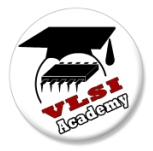 I hope you enjoy and benefit from the VLSI Academy educational and training programs. Programs are tailored to both undergraduates and recent graduates interested to learn more about VLSI Design. We look forward to interact and hear your feedback.